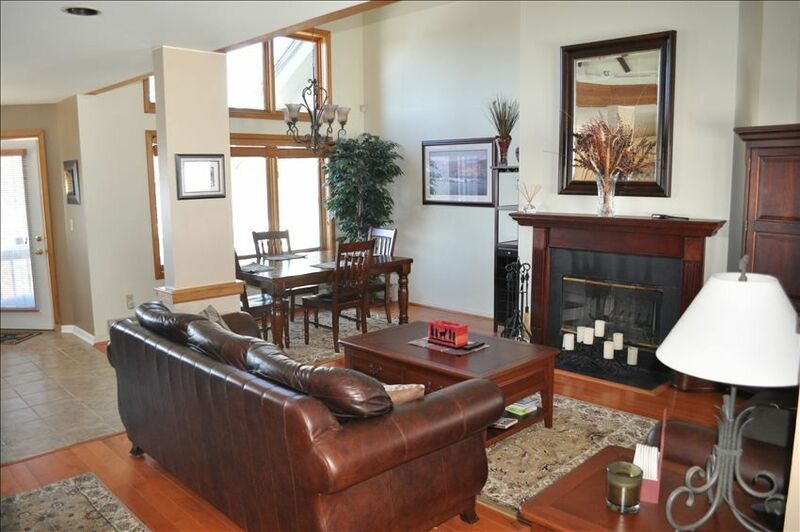 This Bolton Valley Ski Resort 3 bedroom 3.5 bath townhouse is perfect for a family mountain vacation. This 2,000SF unit has ski-on and ski-off access to the Timberline Lift and is located 1/8 mile from the base lodge, restaurants, bar, and sports center, which features a pool, hot tub, sauna, workout facility and kids amusement park (with inflatable jousting, bounce house, airborne adventure, giant obstacle course, Dance Dance Revolution and 14' video screen). Enjoy beautiful mountain views and a cozy atmosphere inside the townhouse. The whole unit has been recently updated with new hardwood, tile, and slate flooring. The eat-in style kitchen has granite counter tops, new stainless appliances, and is also fully equipped for cooking any size meal. The main living room has a 40 inch HD flat screen television with surround sound and Dish Network. There is also an XBox 360 for the kids to use with a DVD player. The townhouse has WIFI. The first floor has two bedrooms, each with a full bath. One has a queen bed and the other bedroom has 1 bunkbed (with a twin on top, and full on the bottom) and 1 twin bed. There is a washer and dryer also located on the first floor. The master suite is located on the third floor and includes an on suite master bath with a jet tub. Come and enjoy our townhouse on the mountain! Bolton Valley Ski Resort is a family friendly mountain as well as the closest ski area to Burlington. This great mountain getaway is also located 30 minutes from the capitol, Montpelier, and 40 minutes from Stowe and Sugarbush. My family and I spent the week of February break here and absolutely loved it. We had plenty of room, every amenity and a great location. My parents didn't ski so they stayed in the condo during the day and they were very comfortable. The owner was so helpful with any questions and the rental process was easy and organized. No complaints whatsoever and looking to book for next year. Thoroughly enjoyed our stay at this lovely home. Being mountainside was key. Accommodations met our needs, comfortable living areas, beds, bathrooms for every one ! ( needed with 4 girls in the group ), full kitchen for preparing family sit down meals. Potential for annual trip with a niece at UVM for the next 3 years. Awesome experience working with owners via phone and emails. Thank you Ellen ! This was not our first time in Vermont but it was the best. Arranging this trip was made very professional and easy by the owners who were a joy yo deal with. They were fair and up front with everything. Once we had arrived the house was Eben more amazing than the pictures. It was extremely clean and well decorated. It was easy to settle right. The house gave off that "home away from home" feeling instantly. Not to mention how close we actually were to the ski slopes. Location was key! The location of this house was not far from the surrounding towns that had great restaurant's, night life, many activities and tourist attractions, and much much more. I would recommend this place to anyone of any age or occasion. We will be back again. Please read owner's rental contract which can be emailed upon request.